Of the five quarterbacks selected in the first round of the 2018 NFL Draft, Josh Allen was seen as the biggest project. Unlike many of his fellow draftees, Allen didn’t play Power Five competition regularly and when he did, he didn’t play well. In three games versus Power Five schools, Allen registered one touchdown and eight interceptions and a 50 percent completion rate. When it came to the nuances of the QB position, Allen had a long way to go, but there were times in college where his athleticism or rocket arm took over. In the 21-17 loss to the Dolphins, that version of Allen rose up, this time against NFL level competition. 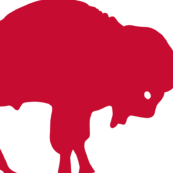 Allen accounted for 88 percent of the Bills offense, a unit that ranks 31st in Football Outsiders DVOA efficiency metric. Allen’s 54.5 percent completion rate in the Miami game is not going to win over box score scouts, but the numbers don’t reflect the growth that people who watched his college film and the game on Sunday have seen. Early in the game, there were several opportunities for Allen to simply take what the defense gave him, but for whatever reason, he chose to either scramble or throw it away. This is a common problem with Allen because he does look to get chunk plays by trusting his arm. On 2nd and 12 late in the first quarter, offensive coordinator Brian Daboll dials up a basic concept known as a ‘Shallow cross.’ It’s a concept Allen struggled with the first half of the season and one that I covered in early October. The down and distance should put Allen in the mindset that he needs to get the ball out to either WR Zay Jones or TE Charles Clay to at least set up a manageable 3rd down. Clay is running a hook route right over the ball and Jones is running the crossing route. Allen is reading the linebacker level. If they gain depth with the hook route, then the cross by Jones is wide open. That is exactly what happens, but Allen fails to get rid of it. He does face pressure as Jeremiah Sirles gets driven into his lap, but the rookie QB needed to do one of two things. Either get rid of it as soon as he hits the top of his drop or keep his base, slide to his right and get it to Jones. A lot of Allen’s issues can be traced back to how he transfers his weight when manipulating the pocket or during a throw. You can see him take a slight step to his left as his back foot hit, so now he is not in a position to smoothly slide or deliver an accurate ball. He is nearly forced to escape the pocket, but no harm done with the nine-yard gain. 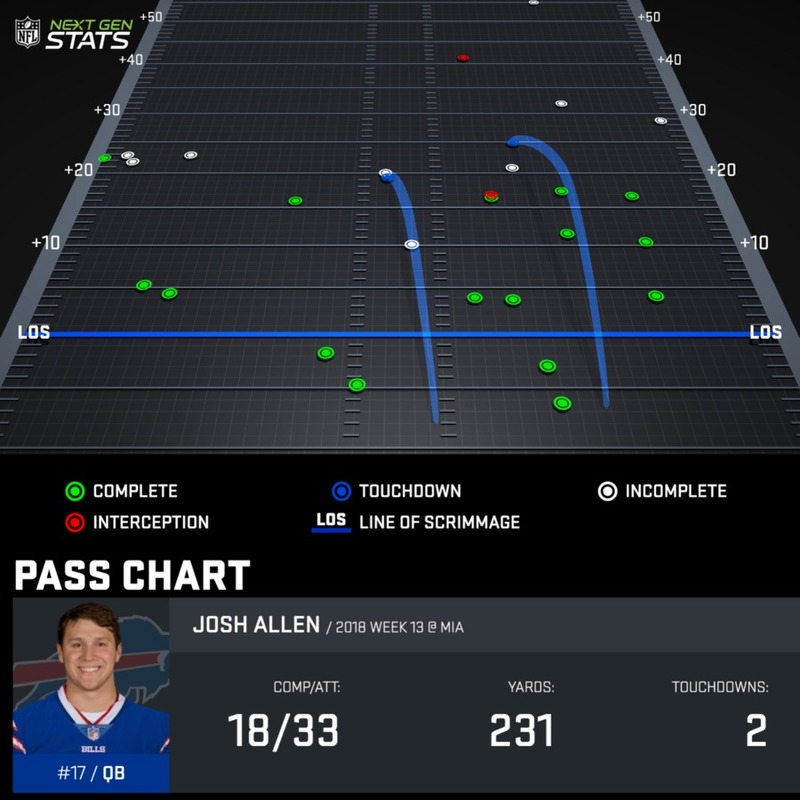 ORCHARD PARK, N.Y. — Last week, Josh Allen returned from injury to help the Bills take down the Jaguars. He rushed for nearly 100 yards and made huge plays with his arm. When we sat down with former University at Buffalo quarterback Joe Licata to break down the game in detail, he pointed out a few plays that separate rookie quarterbacks from the great ones. Of course, it’s not fair to expect Allen to be Tom Brady or Drew Brees in his first season, but the plays were used to demonstrate what Allen should be striving for. This week, Allen and the Bills lost to the Dolphins, but the rookie showed even more special potential as a runner and a passer. As we dove into 15 plays that tell the story of Allen’s performance, there are a handful of throws that Brady and Brees can’t make. You’re seeing the reasons the Bills moved up to draft Allen No. 7 overall. He makes throws few people on the planet can make. “We’re watching a young man grow and develop right in front of our eyes,” Bills coach Sean McDermott said. With the help of Licata, let’s take a look at the film. I've been really impressed with the athletic overall. I look forward to reading it every day. The Sabres content is good too. I remember when 'awesome' was reserved for deity induced miracles. I remember when 'awesome' was reserv﻿ed for deity induced miracles. So like before the 90s when the Teenage Mutant Ninja Turtles used it whenever they ate Pizza? Back when 'walking on water' qualified. Not eating pizza. I thought this was a great write up and shows both Josh’s flaws and where he has excelled. Also does a great job of explaining the low completion percentage. It would be nice if Josh could settle in enough to understand that moving the chains every couple of plays is as exciting as the chunk plays. You remember those times? How old are you?? He's getting better each game. That's what I was hoping for and that's what he's delivering. Lets see what he does this week against the Jets. They're looking for revenge so it should be a good game. All I want to see this year is Josh play and get better every week. If he does that, I think we may have a franchise QB. On that crossing route where he takes off instead- Teller gets blown up immediately and is going backward through Allen's throwing lane and into his lap. When people start getting excited about Josh Allen's performance Sunday, the assumption is that we are talking about his rushing totals. But for me, the encouraging part is his growth in the passing game. Forget all the scrambles. Look at his first touchdown throw to Zay Jones. Look at his second touchdown throw to Zay Jones. Look at what SHOULD HAVE been a touchdown throw to Kelvin Benjamin (but he predictably dropped it). Look at the 3rd Down sideline pass from out of his endzone. Look at that touch pass to Patrick DiMarco down the sidelines. Heck... Even look at the final play of the game. Yes, it was a little bit short. But consider how much skill it took to even get the throw off - and realize it was a fingertip from being one of the most amazing plays the NFL has seen all year. How many guys have the scrambling ability AND arm to make that play? Maybe Rodgers, Newton and Mahomes? Forget all the scrambles. Look at his first touchdown throw to Zay Jones.﻿ Look at his second touchdown throw to Zay Jones. Look at what SHOULD HAVE been a touchdown throw to Kelvin Benjamin (but he predictably dropped it). Look at the 3rd Down sideline pass from out of his endzone. Look at that touch pass to Patrick DiMarco down the sidelines. Heck... Even look at the final play of the game. Yes, it was a little bit short. But consider how much skill it took to even get the throw off - and realize it was a fingertip from being one of the most amazing plays the NFL has seen all year. How many guys have ﻿the scrambling ability AND arm to make that play? Maybe Rodgers, Newton and Mahomes? It was a Charles Clay effort away from being that... the throw was plenty good enough in this league. I don't have a subscription so I don't have access to the article. But I wonder if anyone's charted Allen's throws? What's his percentage when he throws deep middle? Intermediate left sideline? Etc. I wonder if his completion percentage to certain parts of the field is actually solid. Allen kind of reminds me a QB from the Dan Fouts era when a lot of QBs had lower completion percentages because they threw downfield more. I wouldn't say that's the entirety of the story on Allen, but he does dump the ball off less frequently than other QBs. I'm encouraged that Allen is no Trent "Captain Checkdown" Edwards. It seems it would be easier to teach Allen to throw short now & then than to teach Edwards to get the ball downfield. Old enough. That kid was always doing tricks. Loaves and fishes was always popular. I could go for a regular with everything on it and a footlong chilidog! I HATE missing food in Houston!!!! And no, I don't like Tex-Mex!!! Give me Mighty Taco, please!! So basically almost all of Allen's incompletions were on throws of more than 20 yards downfield or a throwaway. Most of his throws were pretty accurate I thought, I just dont see a guy who is wildly innacurate...I see a guy who throws the ball downfield or throws it away a lot which is going to equate to lower completion percentages. Just keep improving a little every week Josh. Yes, the article in the OP mentions that Allen only had one incomplete pass on throws shorter than 20 yards. It could also be argued that if he throws from the top of his drop he should hit Zay in stride over the middle - QBs have made that play. It's more the timing and recognition piece of this. He may have felt the pressure which caused him to stride and tuck and run, but I do think he had a window to throw, especially if he knows Zay is the first read on the play. Yes, Sirles doesn't help by getting bull rushed, but it doesn't completely justify the tuck and run here.